Your first half marathon is an exciting event, but the newness of it can lead to some frustrating lessons. Take it from me. The Long Beach Half Marathon was my first attempt at 13.1 miles, and my race was full of rookie mistakes that ended up costing me dearly—and mistakes I corrected before my next attempt. Here is a look at some first-time mistakes I made that are common among newbies running their first half marathon. 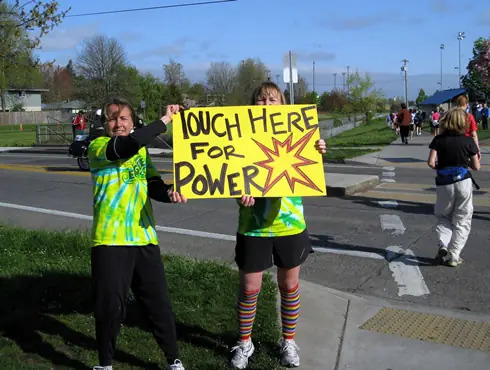 I spent the minutes before the starting gun in line at a port-o-potty, doing the seemingly smart thing by emptying my bladder before running 13.1 miles. Well, my time management didn't work out. I was in the john when the national anthem played (sorry, America) and had to run to the start line and climb a makeshift fence into the correct corral, seconds before the gun went off. I didn't even get a minute to mentally prepare myself. Without experience, your adrenaline is your worst enemy. I was amped, feeling good and ready to break 2 hours in my first half marathon (about a 9:09 pace, close to my training times). Feeling stoked, I ran the first mile in 8:10. The second mile in 8:17. The third mile in 8:11. I started dreaming of a 1:55 half; I should've been bracing for a nightmare instead. As you might expect, the wheels eventually came off. Pacer after pacer started passing me, I was doing stretches of walking by mile 11, and I crossed the finish line in 2:01. Cruel—and a lesson learned. Trust your training, and pace yourself. To piggyback on the previous slide, perhaps your first half marathon shouldn't have a time goal attached to it at all. Make that first experience a chance to tackle the distance without an ambitious expectation. I've always wondered how much better the experience would've been had I not been chasing my goal so hard. For a first-timer, that shouldn't be the point. Right away, I noticed that my GPS watch was not lining up with the mile markers on the course, and it was a source of mild frustration for me. How could the race directors screw that up? Well, in all likelihood, they didn't. For technical reasons explained here, your GPS watch is slightly off. Mine read 13.33 miles when I crossed the finish line of the USAT-certified race. This is normal, and not worth steaming over. Gu recommends having one of their gels 15 minutes before the event, then one every 45 minutes during the event. For my first half marathon, I had a gel at mile 6 (about 53 minutes in), and that was it for in-race nutrition. Big mistake. I bonked by mile 10 and endured the most agonizing 5K of my life to finish it off. For my second half marathon, I had a gel 15 minutes prior, one at mile 5 and another at mile 10, and cruised to the finish line feeling so much better. Realize that the finish line is exactly what you did months' worth of training for, and also be aware that it will probably be photographed. I did the basic one-fist-in-the-air pose. Some people jokingly crawl across the finish, some cartwheel across (I don't know how) and some hold hands with their partner. Whatever you do, make it special. You earned it.